Maybe it was cute to coordinate with your date at the high school prom, but proceed cautiously when it comes to his and hers matching clothing as an adult. Matching a gown with a cummerbund and a corsage was cute at 17, but these days couples don't even wear matching wedding bands. The confident and evolved couple is more apt to showcase individual styles than color-coordinated combos. What about the celebrity couples that coordinate their looks? Costumey styles may work for paparazzi photo shoots and red carpet appearances, but they don't translate well in real life. Even the stars can get it wrong. When Nicole Kidman and Keith Urban sported matching black leather jackets, black baseball caps and dark glasses at a Sydney Swans Aussie Rules football game, the media criticized the famous couple. On the other hand, TomKat, otherwise known as Tom Cruise and Katie Holmes, received praise for wearing matching jeans on a family outing with their daughter. Stylish star couples like Will Smith and Jada Pinkett Smith and Oprah Winfrey and Stedman Graham pull off a coordinated look with subtle details. They choose accessories in matching colors or different outfits in coordinated fabrics. In Korea, coordinated couples are a cultural phenomenon. 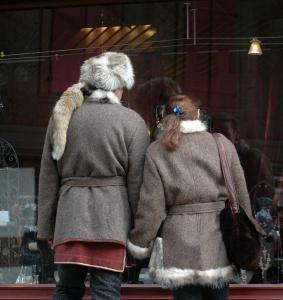 It is quite common for young couples to ask their partners to dress in matching garb as a symbol of their commitment. Much like holding hands in public or turning the heart of a Claddagh ring facing inward, matching clothes are a natural rite of dating in this country. There are times when his and hers matching clothing is appropriate. Halloween: Halloween is the perfect time to wear his and hers matching clothing. Whether you wear identical costumes or coordinate as famous couples, this is the time to go all out. Cleopatra and Marc Anthony, Adam and Eve, Sonny and Cher, salt and pepper, and ketchup and mustard are all great inspirations for matching looks. Home alone: Some couples enjoy purchasing matching underwear. The key is to choose colors, styles and patterns that you both find comfortable. Matching underwear can be worn for fantasy or everyday under your street clothes. Plus, matching underwear makes a great romantic gift and can serve as an intimate secret just for the two of you. Bedtime: Bedtime is a great time to cozy up and wear coordinated pajamas. In fact, this is a look that goes beyond his and hers and can work for the entire family. Catalogs such as Hanna Andersson and L.L. Bean sell warm and cozy matching sleepwear for the entire clan. Sports: L.L. Bean and J. Crew also sell outdoor and sports gear that are fairly androgynous and can work for couples. Plus when you are mountain biking, skiing or hiking as either a couple or a family, it can be practical to be dressed similarly. It helps in identifying other family members in inclement weather and can create a team-like atmosphere. Corporate outings: Many companies like to give out corporate giveaways at team building events and corporate retreats. Or they may ask employees to dress in matching corporate attire at trade shows and conferences. In these cases, it is appropriate to order matching his and hers golf shirts or windbreakers with the company logo embroidered across the chest. The great thing about fashion and personal style is that there are no rules. So if despite what you've read so far, if you still want to step out in matching duds, here are some guidelines for pulling off the look. Opt for coordinated colors in different shades or different outfits in matching fabrics. You don't have to wear matching colors to scream "couple". Similar styles and fabrics can pull you together in fashion and love without appearing too uniform-like.